Vanilla ice cream, peanut butter swirls and itty bitty PB cups? It's like a chilly peanut butter party in your face. Weeeeee! Crispy and VERY peanut buttery, these snacktastic bars have a PB drizzle and are packed with chocolate chips. While you shouldn't make a habit of eating these little Reese's flavored balls for breakfast, a few small handfuls as a snack are really pretty satisfying. And they taste FANTASTIC! 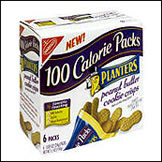 A controlled portion of peanut butter flavored cookies that caps off at 100 calories? We're HUGE fans. 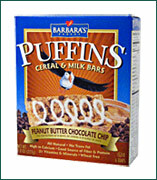 That Barbara sure knows her way around a peanut. These bars are super-satisfying, nutritious and chewy. A peanut butter bonanza! A super-decadent ice cream treat. Lowfat PB ice cream, chocolate ribbon, and micro-pb cups snuggled inside milk chocolate coating. One of the best bars EVER. These fairly new treats from Balance are so ooey, gooey and chewy, they're practically candy bars. They even have a bonus layer of caramel and PB coating! Straight up AWESOME peanut butter cereal. 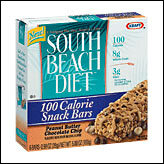 Great for recipes, or as a stand-alone snack. Crispy, crunchy, rice-tastic snacks for chocolate peanut butter fanatics. Two yums up! Hey! Next week is National Pickle Week. Despite being high in sodium, these green, crunchy critters are a tasty, awesome low cal snack. You're not the only one obsessed with peanut butter. Click "send to a friend" and share these tasty finds with humans you like NOW!